The forestry sector makes large direct and indirect contributions to the mitigation of greenhouse gas (GHG) emissions from New Zealand, and its contribution could be even larger if we set the right policy. Forests are a major store of carbon – standing trees, and the organic layer of forest soils are both significant carbon reservoirs. If the area under forest is increased then the size of this reservoir also increases. New forests sequester extra carbon from the atmosphere as they grow and are therefore carbon sinks. In this way forests can play a significant role in reducing the impact of greenhouse gases on climate change. The rate of carbon sequestration by forests depends on the growth rate of the trees, but planting of new forest, rehabilitation of existing native forest, or allowing scrub or uneconomic farmland to revert to forest are all mechanisms by which sequestration will occur. Radiata pine plantations typically sequester between 25 and 30 tonnes of CO2/ha/year, and forests planted on marginal farmland will store additional carbon that would otherwise be in the atmosphere. Replacement of grassland by forest is almost insignificant on a global scale (Piers Maclaren, pers. comm..), but is hugely important for New Zealand. The recent release of “New Zealand Energy Greenhouse Gas Emissions” from the Ministry of Economic Development (2009) highlights the important role that forestry plays in reducing our net emissions of CO2 equivalents. In 2007 our total national greenhouse gas emissions were estimated to be just over 75,000 kt CO2-e, while net absorption of CO2 by forests reduced our net national emissions to just under 52,000 kt CO2-e. Recent projections of sequestration by “Kyoto-compliant” forests (planted since 1989 on grassland) for the first Kyoto commitment period (MfE 2009) imply an average sequestration rate of just under 33 t/ha/year (this high estimate perhaps reflects the current of age of our Kyoto-compliant forests, because sequestration rate is typically lower early in a rotation and most of these forest are middle-aged). This direct contribution to GHG emission mitigation results from previously planted forest. Historically, planting occurred in three phases, as shown below. In general forests in their first rotation will be the major contributor to reduction in net emissions cited above, although changed management practices on forests planted earlier, that increase the volume of the growing stock, will also contribute. This is discussed in further detail below. When forests are harvested CO2 may be released into the atmosphere, and so over many rotations the carbon stored follows a “sawtooth” pattern, as shown below. GHG sequestration benefits of afforestation in periodically harvested crops therefore need to calculated by assessing the average carbon store over many rotations. The cyclic historical pattern of investment in new plantings means that emissions from forest harvesting will also be somewhat cyclic, and those areas planted during the latest period of high investment, in the 1990s, are likely to be harvested during the 2020s. In order to avoid a serious problem in our future national GHG accounts we need to increase the rate of new planting right now. Unfortunately our net stocked area of plantation forest slightly decreased recently, especially just prior to the introduction of a tax on deforestation of “non-Kyoto” forest in 2008, and new plantation establishment is currently at an extremely low level. New forest planting is a very feasible and viable method to reduce New Zealand’s net emissions. New plantings will provide capacity for New Zealand to implement cost-effective reductions in industry and agricultural emissions, and possibly to develop new sequestration technologies. Land growing forest instead of livestock means our emissions of CH4 and N2O, two important GHGs, are much reduced. These agricultural emissions account for roughly half of our total emissions of GHGs, unlike in other first world nations where agricultural emissions are relatively minor components of total emissions. Wood used as a structural material has much less embodied energy than alternative products, and as our marginal energy production emits GHGs, any reductions in energy use can reduce our overall emissions. Air dried wood has an embodied energy footprint of 0.5 MJ/Kg, compared to 34 MJ/Kg for steel, 90 MJ/Kg for plastics and 170 MJ/Kg for aluminium (Lawson 1996). Concrete manufacture produces CO2 and also has high energy costs. Wood is an important, GHG-neutral, source of energy, and use of wood for energy displaces generation technologies that release GHGs. On a global scale this is a very important contribution, with typically 80% of wood harvested in developing nations being used for fuel. Other wood uses, such as treated roundwood, non residential construction, also form temporary carbon sinks. Does the forestry sector contribute to climate change? If only GHGs are considered then benefits from forestry are overwhelmingly positive, but afforestation can impact on global temperatures in at least one other significant way. The albedo of grassland is typically 0.24 to 0.27 compared to approximately 0.12 for radiata pine plantations (Moore 1976). This means that replacement of grassland by plantation results in greater short wave absorption and this can contribute to increasing temperatures through increases in long wave radiation emitted from the landscape. 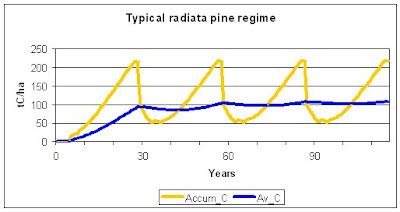 In an Australian study Moore (1976) observed that long wave radiation above radiata pine forest land exceeded that above grassland by 15% and 25% during winter and summer respectively. On a global scale it has been estimated that up to 40% of the sequestration benefits of replacing grassland with forest might be offset by this effect (Gibbard et al. 2005). New Zealand’s radiata pine plantations are likely to contribute proportionally more to climate change mitigation because they are very highly productive, and also because they are established in areas where snow is either infrequent or where snow never falls. Snow has a very high albedo, and covering of snow by foliage can greatly impact on energy absorption in the landscape. A brief analysis of this “albedo effect” under New Zealand conditions has been undertaken but the results are not yet available. The albedo effect is permanent, while CO2 sequestration benefits accrue primarily during the first rotation after plantation establishment, assuming no changes are made to either numbers of trees/hectare or rotation length. It should be noted, however, that most indirect forestry contributions to GHG emission mitigation are also permanent, and so we shall have to await further quantification of these processes before drawing any conclusions about the significance of the albedo effect in New Zealand. How could we increase the forestry sector’s contribution to GHG emission mitigation? increasing the use of wood as a construction material. Many hundreds of thousands of hectares of pastoral land would be more suitable under forest. 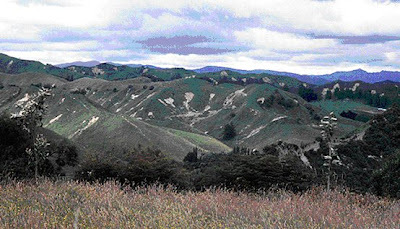 These include steep and eroding land in the Manuwatu and in the East Coast region of the North Island, where erosion contributes to flood damage and results in demands on taxpayers to provide financial assistance for flood relief and recovery both in the hills and on floodplains below the eroding hill properties. Re-establishing forest on eroding hill country would not necessary require a significant reduction in farm production; rather it could be achieved by increased use of trees on farms, with generally the land most unsuitable and least productive for farming going into trees. Changes in land tenure would also not be necessary; joint ventures (where the farmer retains ownership of the land, and other investors provided the capital to establish forest) can be established easily under existing legislation. The Emissions Trading Scheme (ETS) is available to “post-1989” forest owners, that is, owners of forest that replaced grassland after 1989. They can opt to measure and then sell carbon credits known as Emission Trading Units (ETUs). It has been shown (Evison, 2008) that the ETS will markedly improve the profitability of “post-1989” forests, under reasonable assumptions of carbon price. If administration and compliance costs are not excessive, and the market functions well (i.e. forest owners are able to buy or sell ETUs in the quantity required and at what is seen to be a reasonable price), then the scheme should provide additional incentive for new land to be planted. Unfortunately, the ETS is currently not providing a significant incentive for forestry, because of the continuing uncertainty around the specifics of the scheme and the prospect that some emitting sectors may not have to participate. The prospect of forest owners having to pay carbon credits for forests destroyed by wind, fire or disease is creating additional uncertainty, with the forestry sector proposing a government-initiated insurance scheme to cover these contingencies. Further uncertainty is created by the fact that the current market is reliant on the agreement relating to the first commitment period (to 2014) and that no agreement to cover subsequent commitment periods is in place yet. In addition, it is significant that most “post -1989” forest land is on relatively small holdings, and recent afforestation has been mostly on small holdings. This is likely to increase compliance costs per hectare; it is not known if this will discourage new planting by owners of small parcels of land. It is also significant that many people in the farming sector have very little forestry expertise and there is a high level of antipathy towards afforestation of farmland in rural communities. This antipathy is perhaps partly engendered by a perception that industrial scale forestry negatively impacts on those communities. providing expertise for owners of small areas of land to assist with afforestation on eroding farmland. With the right incentives, existing forests can be managed over longer rotations and at higher stockings, both of which significantly increase the average amount of carbon stored in forests. Unfortunately, owners of forest planted prior to 1990 cannot accrue carbon credits in their forests, but they have to purchase ETUs if they change land use to cover the “emissions” associated with land use change. The Ministry for the Environment reports that 566,106 ha of New Zealand’s commercial forest land was planted between 1990 and 2007 (MfE, 2009), and is therefore classified as “post-1989” in the language of the ETS Bill. 1,451,900 ha of commercial forest land are “pre-1990”. This means that 72 % of current planted forest is excluded from earning ETUs in the ETS. The policy as outlined in the current ETS regulations, in providing compliance with the Kyoto Accord, ignores issues of equity for existing forest owners, by not rewarding owners on a “like-for-like” basis. Essentially, pre-1990 plantation owners have been providing a carbon storage service for free, and the ETS scheme in its current form would impose a penalty should they stop providing this service. Incentive to deforest prior to Jan 2008. It is highly likely that some land owners ‘brought forward” deforestation in order to avoid the penalties that would be incurred from Jan 2008. Thus features of the proposed policy itself generated deforestation. Increased complexity in decision making for forest owners. The current rules provide a strong disincentive to land use change. The flexibility of relatively unconstrained land use change would not be available to owners of pre-1990 forest land, and this will affect their land values as well as their options for development of their properties. In turn this may influence profits of forest enterprises and overall confidence in forestry as an investment option. The definition “pre-1990” is applied to the land, not the forest crop, so this constraint is applied for an indeterminate period. There is a loss of revenue to those forest growers. This is both inconsistent and a disincentive for those forest owners to manage their forests to meet the nation’s goals. There will also be a loss of sequestration capability to the nation that could be harnessed by silvicultural changes to these existing forests. Assume sequestering 25 t per ha of CO2 or 625 T at a 25 year rotation, this implies an average store of 312 T in a radiata pine forest site. If the rotation age increases from 25 years to 35 years, this would increase the average store of carbon to 437 t.
This is an incremental 125 t per hectare average or 181 million t of carbon potentially at steady state, for the 1.45 million hectares classified as “pre-1990”. These are rough figures, based on a linear sequestration rate, but they show the scale of the potential benefits of applying the post-1989 forest ETS rules to pre-1990 forests. Note also that, that under Kyoto rules, these increases may not be able to be applied to meet our Kyoto commitments, but they would benefit the environment. This is a simplistic analysis – it assumes that all forest owners are currently managing their forests on a 25 year rotation, and would change to a 35 year rotation. To minimise disruption to the timber supply, any such change would also need to be managed over a relatively long period. Because differentiation of forest land into “pre-1990” and “post-1989” mirrors the Kyoto protocol, any changes to the treatment of “pre-1990” forests may impose extra Kyoto commitments, and it is important to determine who should pay for this. Essentially Kyoto’s treatment of these forests is asymmetrical, because only depletions in storage are recognised. Any credits provided to pre-1990 forest owners would depend on local demand only, assuming they cannot be applied to our Kyoto commitment. Impact on market price of units under ETS. Allowing non-Kyoto-compliant credits in the ETS may lower the price of ETUs. These areas would need further analysis. Kerr and Sweet (2008) have asserted that full carbon accounting (i.e. including “pre-1990” forests in the ETS) would be possible under Article 3.4 of the Kyoto protocol. If so, barriers 1 and 2 would not apply. GHG sequestration in existing forests could therefore be greatly enhanced by removing the distinction between pre-1990 and post-1989 forests in the ETS legislation and allowing all forest owners to choose to participate in the scheme under post-1989 rules. More analysis may be required prior to scheme implementation to fully understand transition issues, and the management of risks such as those outlined above. Buchanan’s analysis suggests that item (2) above may be a significant contributor, and that likely impacts in New Zealand would be significant but small relative to our total national emissions. Item (1) is often discussed, but it requires an increase in either total building stocks or in the proportion of wood used when old structures are replaced by new ones. Item (3) may be even more significant than item (2) according to Gustavson et al. (2005). No major changes in policy are required in order to capture benefits from increasing wood use in building construction, but a coordinated research, education and promotional campaign would be required in order to change people’s habits (Buchanan 2005). The world as a whole is more than meeting its Kyoto Treaty commitments (New Scientist 2008), and so New Zealand has much to gain from carefully setting policy so that the forestry sector realises its potential to allow us fully to meet our own future commitments. This could be done solely through afforestation. For instance, as Piers MacLaren (pers. comm.) points out, if we consistently achieved a new planting rate of 50,000 ha/year, it would take the best part of a century before we established forest on all our eroding landscapes, and meanwhile we would have carbon credits to sell to others on the international market. If we went further and allowed pre-1990 forest owners to claim credits for increased carbon storage, then we could make a further contribution to the mitigation of climate change, even though Kyoto rules may not allow the sale of credits from such forests in the international market. Moreover, our goal should be to solve the problem, not to just make money from credits. Finally, developing new building technologies that use wood, and promoting the benefits of timber in construction, will also reduce green-house gas emissions.